Living in an Inbox | Cultura-plasmic Inc. Living in an Inbox is an immersive and interactive video installation exploring digital addiction through advertising, the search for comfort in familiar routines, quick fixes and instantaneity, and the digital architecture of our modern ‘homes’. As online spaces become part of our lived experience, we find ourselves spending more time in our multiple inboxes – checking for new messages and waiting upon those anticipated notifications that stimulate the feeling of pleasure when granted with a ‘reward’. (In one study, the participant used a tracking app finding that they checked their phone 1000 times a week, exceeding their 700 notifications). Digital spaces become a home, a place where we feel comfortable. In workplaces, memos are circulated reminding people to talk to their colleagues when possible in an attempt to minimise digital clutter (we avoid in-person social interactions because it’s easier to press Send). Addiction and comfort go hand-in-hand. We seek quick fixes that trigger that familiar feeling of dopamine momentarily making us feel good. We’re trapped in a cycle of obsessive checking and compulsive scrolling (multiplying with every social media platform), even if we consciously know that the intellectually nutritional value of these messages is zero. Nir Eyal’s Hooked was instantly a bestseller with its research-informed guidance on how to create habit-forming products by ‘creating a craving’ in their users and mimicking what he calls the ‘narcotic-like properties’ of sites like Facebook and Pinterest. He describes Facebook’s news feed as a classic example of how digital design can pull users into an intensifying cycle of trigger, action and variable rewards (the same model that underpins the gambling industry). Dopamine Labs designed the dopamine API using neuroscience research into what triggers the release of the neurochemical to encourage repetitive behaviour. Ironically, they also design products that counteract digital addiction and enable users to feel a sense of control over said compulsions, creating the demand for a new product in the process. Facebook’s founding president, Sean Parker, has criticised how the company ‘exploit[s] a vulnerability in human psychology’ by creating a ‘social-validation feedback loop. Tristan Harris, former ethical design proponent for Google says, ‘[The biggest tech companies] have 100 of the smartest statisticians and computer scientists, who went to top schools, whose job it is to break your willpower.’ Something to remember next time the web is considered as a space to exercise freedom. When digital users are faced with abstaining completely from digital devices and social media sites, their experiences share similarities with withdrawal symptoms more commonly associated with substance addiction. A study by International Centre for Media & the Public Agenda (ICMPA) and the Salzburg Academy on Media & Global Change reported how students responded with cravings, anxiety attacks and depression and described their emotions as ‘fretful, confused, anxious, irritable, insecure, nervous, restless, crazy, addicted, panicked, jealous, angry, lonely, dependent, depressed, jittery and paranoid’. 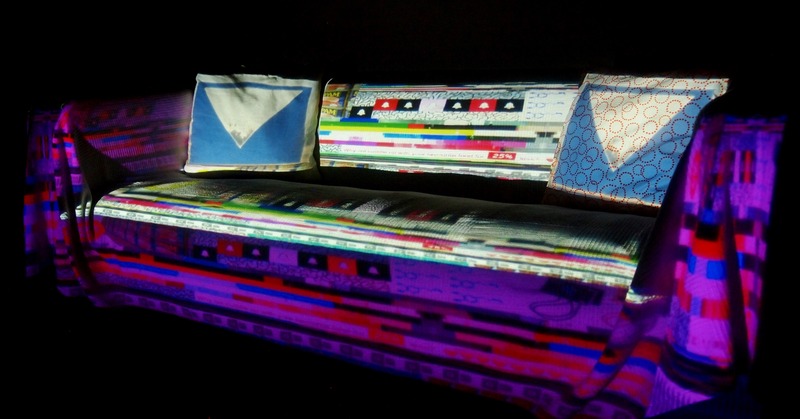 Based on a living room set-up with comfy sofa, cushions, and TV, a rolling ‘feed’ of spam is projection mapped onto the scene. An advert plays creating the connection between obesity/addiction to fast food and infobesity/digital addiction, calling upon the language of the #oddlysatisfying videos, a social media trend that demonstrates how digital content is being used to support the desire for instant gratification and short-term therapeutic purposes. One study found that this trend is particularly popular with children and young people who watch these videos before bed to help them relax in preparation for sleep, acting as a kind of technicolour all-glittering micro-therapy. Incorporating keywords and catchphrases from corporate advertising, this diet of excess and overconsumption is framed as valuable and intimate social experience. The advert is loosely based on the span of a day referring to the pervasiveness of digital media that creeps into every hour (66% check emails and social media before getting out of bed each morning, rising to 80% of people who check within the first 15 minutes of waking. Digital communications saturate our workplaces and relationships, attempting to fulfil both productive and relaxation roles, it’s the last thing we check before sleep and our devices are always within close reach of the bed. 10% admit to waking up and checking their feeds during the night). Referencing the rise of facial detection and emotion-tracking technologies in advertising and digital media, the advert component of Living in an Inbox incorporates eye-tracking technology to make visible how much data we give away when watching a screen. As the viewer watches the video, any eye movement triggers a burst of ‘likes’ which spawn from successful attempts at distraction and indicators of shortening attention spans. Distraction, the competition for attention and targets of repeated engagement – we are only just starting to look at the effects of media multi-tasking on the brain (this study at the Uni. of Sussex recently found a decrease in grey matter density in the brain’s anterior cingulate cortex, relating to decreased cognitive functioning and socio-emotional regulation). Responding to this battleground of the attention economy, Living in an Inbox draws upon art’s ability to encourage prolonged focus and concentration, and an awareness of the power of the gaze. Developed whilst Artist-in-Residence at Can Serrat, El Bruc, Spain (2018).